Bill Clinton and a giant insect expertly burned paranoid Donald Trump on Twitter. 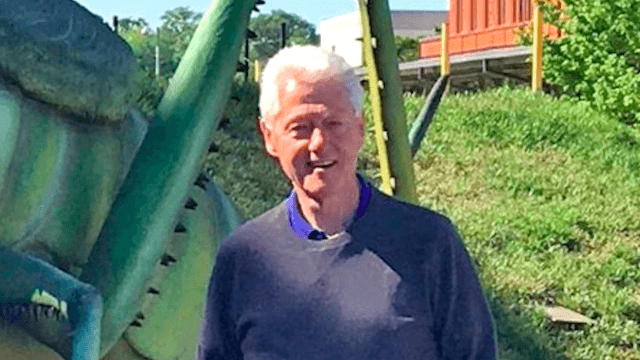 On Sunday, former President Bill Clinton took advantage of a new installation at the Clinton Center in Little Rock, AR to throw major shade at his successor, Donald Trump. Standing in front of a giant grasshopper statue, he tweeted the following message. The reference to the center being "bugged" clearly seems like a reference to President Trump's repeated claim that President Obama ordered an illegal wiretap on him at Trump Tower, an accusation that Trump has offered no evidence to support, and which has been widely refuted by the intelligence community. It's also one hell of a dad joke. The "bugging" pun is bad enough to make anyone cringe, even without the visual aid of an enormous insect. Clinton may have once been the most powerful man in the world, but now he's a corny grandpa. The statue is part of the Clinton Center's new Xtreme BUGS exhibit, and was installed to coincide with Earth Day. So far, there's been no public reaction from President Trump to the tweet. But considering how sensitive he is, it's safe to say it's bugging him.